The House of Lords has rejected a "pro-life" charity's challenge to laws allowing therapeutic cloning. The procedure involves taking healthy cells from a patient and using them to create copies, which could be used to replace or repair damaged or diseased tissues and organs. Scientists hope the procedure could one day help people who have had strokes or spinal cord injuries, or who have conditions such as Alzheimer's and Parkinson's disease. Five Law Lords unanimously dismissed the charity's appeal on Thursday. It was the latest round in a court battle by pro-life campaigners to change the law on therapeutic cloning. Therapeutic cloning is governed by the Human Fertilisation and Embryology Act 1990. 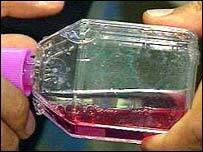 The Act was amended by Parliament in January 2001 to include cloning research. But the Pro-life Alliance challenged that decision. It argued that embryo cloning for medical research purposes fell outside the scope of the Act. The law allows researchers to create human cell clones but not whole embryos beyond 14 days old. The idea is that the nucleus of an egg cell is removed and replaced with the nucleus of a cell from the person to be cloned. The egg cell then develops into an embryo clone of that individual and is mined for stem cells which can be encouraged to grow into replacement tissues that are a perfect genetic copy of the person. In their judgement, the Law Lords backed Parliament's ability to authorise therapeutic cloning, under strict licensing conditions, for research into the production of compatible cell tissue with which to fight disease. Lord Bingham said that Parliament, in passing the 1990 legislation, could not rationally be regarded as having intended to leave cloned embryos outside the scope of the Act "had it known of them as a scientific possibility". "There is only one possible answer to that question and it is negative," he said. A spokesman for the Pro-life Alliance said: "This is a shameful day for British democracy. "Such disregard for the principle of the separation of powers, by which judges only interpret the law rather than rewrite it, is a terrifying departure by the courts and creates an extremely dangerous precedent. "It totally undermines parliamentary sovereignty and the rule of law." He added: "Cloning is wrong because it involves the experimentation and destruction of early human life. "Future generations will look back in absolute horror at this government's wholesale disrespect for human dignity and will see the House of Lord's judgment today as an extremely sorry chapter in British judicial history." Suzi Leather, chairman of the Human Fertility and Embryology Authority, said: "The assurance that the regulatory system in the UK applies to all types of embryos, provides a firm basis for research to take place in this country. It is reassuring that the five law lords who heard the appeal dismissed it unanimously." The Pro-Life Alliance had earlier sought a judicial review, and won its case at the High Court in November 2001. But the Court of Appeal overturned the decision a few months later. The Alliance then decided to go to the House of Lords.